Exclusive UltraDomeTM technology eliminates weak points. 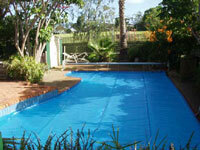 Supertoughened polyethylene resists salt, sun and chemicals. Warm your pool free by up to 8C giving you months more swimming time. Roll on or off in 30 seconds with a Daisy Roller System. 1. Measuring your pool is simply a matter of measuring the maximum water level width and length of the main body of water. 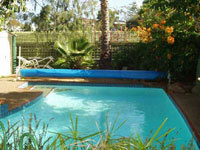 Visit Daisy Pool Covers on the web.